Updated ground floor condo, 2 bedrooms (queens), 2 rollaways, 2 full baths. Savor the picturesque views from this stunning vacation home in the prestigious Desert Falls Country Club in Palm Desert. This newly remodelled two bedroom lower level condo, right on the golf course, is ideal for your 24/7 enjoyment. If Tennis is your passion, this is your perfect option. The location is superb, overlooking the entire 12th hole, including the tee box, a dazzling lake, green and the attractive clubhouse in the background. This south facing view from the patio is further enhanced by the glorious mountain range that surrounds the Coachella Valley. Inside, you will be welcomed by the tastefully decorated environment in this 1330 square foot unit. The impressive open floor-plan in the living and dining rooms feature a gas fireplace, attractive built-in office and entertainment centre, complete with a 42' LCD Flat Screen TV, desk and shelving unit. Continue on through the sliding glass doors to the inviting patio with both dining and conversation areas plus a deluxe Charbroil gas grill. The brand new, fully equipped kitchen, with stainless steel appliances and granite countertops will delight your culinary instincts. The spacious Master Bedroom Suite, with its own access to the patio, boasts a king sized bed, 2 large mirrored closets and it's your own suite with a new granite-topped, double sink, vanity and a walk-in shower. The airy second bedroom has a queen bed, new LCD Flat Screen TV and easy access to the second fully remodelled bathroom, with tub and shower. There are two twin size fold up beds for added guests.. All the beds and linens are top quality. A laundry room with washer and dryer offer added convenience. In addition to the many amenities provided by this upscale accommodation, the Desert Falls CC Complex has much to offer with its 25 swimming pools and Jacuzzis and a magnificent clubhouse complex that is fully accessible to guests. This includes free use of 9 lighted Tennis Courts, a Fitness Center with state-of-the-art exercise equipment, Pro Shops and a friendly restaurant/bar. The Golf Course at Desert Falls CC is a 7000 yard, par 72 championship venue with full driving range, massive putting green and designated chipping area. Desert Falls is only minutes away from a world class dining and shopping experience on the renowned El Paseo Drive. It is also a short drive to the hip and trendy Palm Canyon Drive in glamorous Palm Springs. You’re invited - Come and enjoy! We live in Portland, Oregon. Originally from Ohio, we of course like THE Ohio State Buckeyes. We also support the PAC 12, and with each of our threes sons claiming different alma maters (Oregon State, Southern Cal, and U of Oregon) football season can be very interesting ! We were just killing some time touring open houses in the Palm Desert area during a recent visit, with no intention to buy anything. We fell upon this place, and loved the quality interior upgrades, the view, and the location....and changed our minds about buying. Beautiful view and furnishings. Everything was perfect. Would definitely recommend staying here. Relaxing stay in this clean, comfortable condo. This condo on the golf course was everything we wanted: clean, roomy, comfortable, with a well stocked kitchen, and a view even better than the online photos. Quiet at night, and enjoyed watching the golfers during the day. Pool and hot tub close by, and hardly anyone using them during our stay. We felt so comfortable here that we had all our dinners in, and the BBQ was well used. Close to groceries and restaurants, as well as highway access to Joshua Tree NP, the tram, and all the tourist sites. Desert Falls is a nice complex, and we'll stay in this condo again the next time we visit. Neat, clean and well equipped. Very well decorated. We definitely enjoyed our stay. Beautiful, very well maintained, and very clean condo. 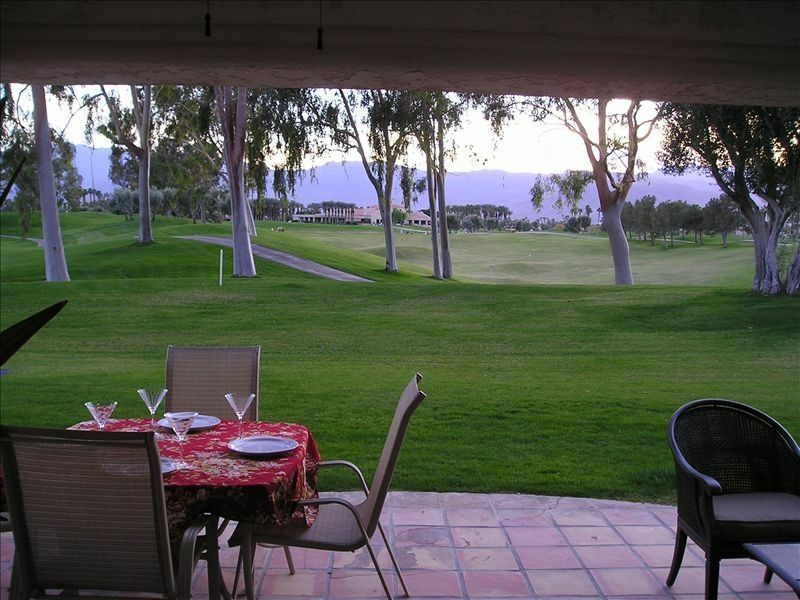 On the golf course, beautiful mountain and sunset views from patio. Great, comfortable beds and a very well stocked kitchen. Great spot for a get-away to the desert. We are happy you enjoyed your stay, and thanks for the review ! Et herligt sted, hvis man skal til flere steder som vi var. Rentals less than 28 days will be assessed a 11% tax in addition to the posted rate. This is in compliance with the Palm Desert Short Term Rental Occupancy Tax.